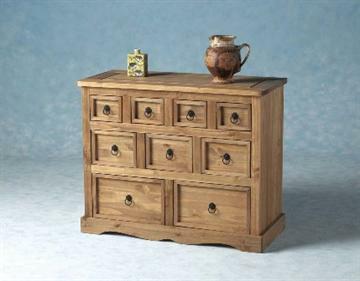 The Corona Pine 9 Drawer Merchant Chest is the ultimate storage solution for use anywhere around the home. 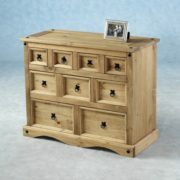 Built to a high standard using thick solid pine you can be sure that this chest will stand the tests of time. 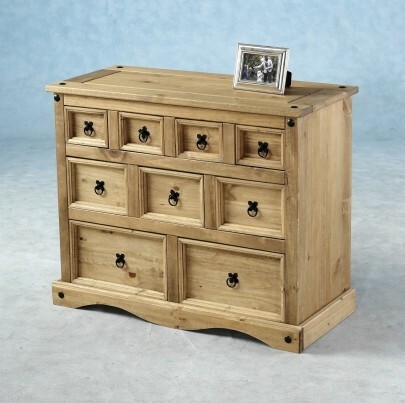 The waxed finish helps to lift the grain of the wood whilst the antique detailing adds to the distressed rustic look. 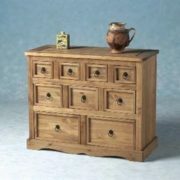 As with all pieces in the Corona range this item is flat packed for easy home assembly.Explore the other products in the Corona Mexican Pine furniture range which includes, bedroom, dining room and living room furniture.